I don't know how it is elsewhere, but around here and in NC, there can be good gold associated with blue clay. I have a couple ancient stream bed deposits I work, and the clay is usually only blue when first exposed. After a bit of time in contact with the air, it seems to oxidize to a more gray color. If I were you I would definitely get a pan and see if there's any gold there. The photos are great! Thanks. To me, the upper reddish brown, thick layer looks somewhat like till, but it is overwhelmingly clay with only scattered larger gravel clasts. It might be a lacustrine clay containing dropstones (dropped from the bottom of glacial ice as the ice melted at the contact with water) derived locally from volcanic or igneous dike materials. The bright red layer is hematite-rich clay. The hematite probably was washed down from the overlying, reddish brown lacustrine clay (if my idea is correct), concentrating there because it could not penetrate into less permeable bluish clay below. The bluish clay would be a weathered zone consisting of of pure clay (that you can probably roll up and tie in knots, like modelling clay--right?). Below that (bottom of the excavation) is the same reddish brown material containing possible dropstones as in the upper layer. If my explanation is correct, the geological report you have would not seem to be incorrect. This is all very interesting, IMHO! Anybody else want to take a stab at it? What makes for the blue color? when the hematite leaches out all the way, clays are usually white, right? would the blue be of organic origin? Heath, that is a striking color change, and nice photos, esp. the third one, thanks! > The photos are great! Thanks. > report you have would not seem to be incorrect. > This is all very interesting, IMHO! > Anybody else want to take a stab at it? Thanks for that Norman we ( Me and the two local Geologists helping me with this work have not been able to find even the finest laminations in any of the layers, the bright blue clay is plastic but so is the red- brown above, and the red below the gravel bed The overlying and thickest deposits that cover the entier area ime working, is made up of a very dry, friable red brown loamy clay with minor pebbles, below that i usually find an at first blue sandy clay containing organic materal mostly what looks to be shiny very bright coal, this layer does change to a bland grayish coulor after being exposed for a while, this layer as well as the gravel bed must be related as ive excavated mammal bones that were tightly encased in both layers, ie half in the packed gravel the other in the packed clay above. The area north of here( about 3 miles) is stated as once being the location of a large ice damed lake, this might give us the water to create these individual layers, ie slow melting and escape to the south, but does not explain the bone and organic material in the gravel bed, nor the basaltic andersite that lays to the north and south of its place of origin the almost straight line of the Cleveland dyke running in a south east north west direction. The 3 new images show the gravel bed at 2 different locations and the related blue gray layer above, i have found mineralized bone and organic material incuding hazel shells and beech mast. The pic showing the bright veins in the lower red clay under the water line i believe is related to the same event that caused the bright layers at the location in the erlier post. The blue color is reduced iron. Iron in sedimentary deposits is well-known for ease of reversal in oxized and reduced states. I should not have referred to it as weathered. Altered, maybe, but not weathered. Lake bottoms are prime places for reduction of iron. It would happen in stagnant conditions where organic matter also escapes oxidation due to inadequate circulation of water that has been in contact with the atmosphere. It is common for only the bottom sediment to be reduced (because, of course, that does not circulate), but the overlying water to be oxygen rich (because it can circulate). The reduced layer here is striking in the contrast and sharp contacts with overlying and underlying oxidized zones. I attribute that to poor permeability of the clay, but it is unusual. I'd still like to hear alternative interpretations. In a case like this, two heads may be better than one. Bones being found across the contacts, buried half-in-half in the layers, suggest those layers are of secondary origin. That is, diagenetic (the right term to use in place of “altered” or “weathered”). The lower conglomeratic zone in these photos suggest debris flow deposit to me, rather than alluvium. You might think about a catastrophic glacial lake outburst deposit, rather than slow melting--like the Glacial Lake Missoula flood in the States. There is information on-line about the kinds of deposits formed by such events. 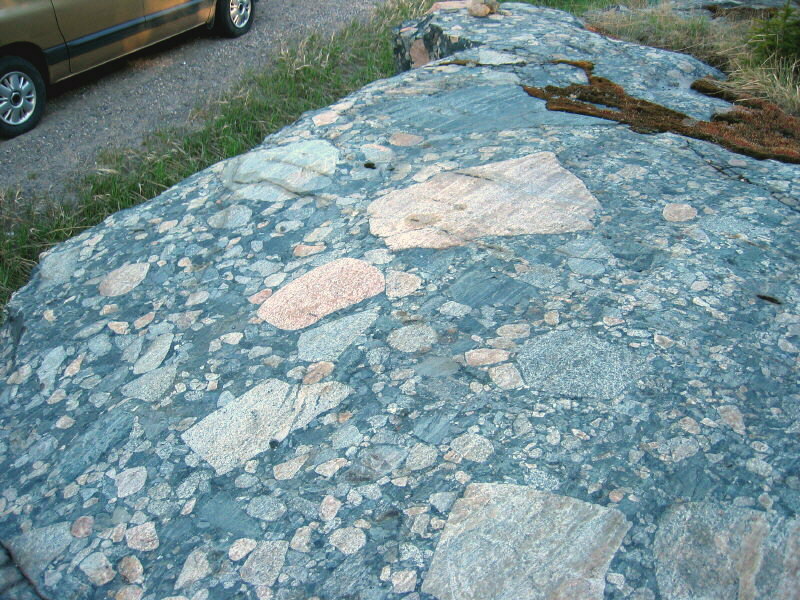 The Gowganda Formation in northern Ontario Province, Canada is full of glacial dropstone deposits. You could look those up also. The texture is similar to that in your upper layer. The two most recent photos (DSCF0371.001 and IMG_8115-001) don’t show such sharp contacts, and are more typical of contacts between oxidized and reduced zones in sedimentary strata that I have seen in the field (I’ll see if I can get some together to post, but I have a job to do today that will keep me away for several hours). 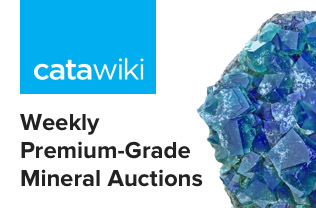 I sometimes wonder if the blue colour is at least partly due to microcrystalline vivianite? - its more common in freshwater deposits, in marine environments its usually grey. But you can get clays with an intrinsic blue colour too, especially smectites. Great photos Heath! Are there any mines up with you? ones that I can go down into? Thanks to everyone as Norman said more heads are definatly better, Norman the biggy here is that if these layers are of late devension were did the organic matereal and bone come from as this area was supposed to have been under mountains of ice, a gravel bed containing very well preserved organic material dose not fit into that picture, does it ? ps anything you have i can use as a comparison would be most welcome as this is a big problem for me ie stuff i can trust! The following images show a days work on my main excavation and shows me uncover a set of ribs burried in the layer above the gravel bed, ive found a lot of bone from this dig all from either the gravel bed or layer above, the layers above that are so far lifeless both in bone and stone fossils. I am going to divide this into a couple of separate postings in order to keep you all with me, and with three photos per page. My analogies are mostly from the Gowganda Formation of the Huronian Supergroup in Ontario, Canada. These photos are from near Elliot Lake, 10 or so km north of the north shore of Lake Huron. These beds were deposited about 2.35 billion years ago under glacial influences. Some are claimed to be tillites, others are laminated and were apparently glacial varves, and some are muddy sediments containing dropstones. These beds are all metamorphosed, and are now very hard argillites and quartzites. There are places where some of my group banged on them with a sedge hammer until their arms almost fell off, and they could not break off a sample (on the other hand, I just walked along and picked up pieces from the ditch–that’s the wisdom we get with age!). One photo is of Upper Carboniferous (Pennsylvanian) beds in St. Louis, Missouri, and is not very glacial. It shows a portion of a cyclothem with an iron-oxide rich clay layer and bluish mudstone beneath it. Cyclothems were deposited during glacially controlled sea-level fluctuations resulting from variable amounts of former sea water locked up on land due to glacial advances and retreats in Gondwana, so there actually is a glacial connection, but that’s another story. I’ll show that photo first. The red layer is clear. Ignore the strata above it, because it is nothing like your situation (it’s gray shale and then limestone with marine fossils). The claystone below it is largely yellowish and greenish gray just below the iron oxide layer, and is bluer below. Such bluish clay does occur here and there, but is not really common. Ralph Bottrill could be right about the vivianite, but I don’t think the clay in that zone could be pure enough montmorillonite for that to be the source of the color. I wouldn’t hang any interpretation on that color. The red layer isn’t very important, either–it’s a secondary (diagenetic) feature. The photo below is the Gowganda Formation that shows muddy layers in the lower half with discontinuous thick lenses of gravel. The upper half is sand with continuous thin gravel layers. My interpretation is that this was a glacial outwash plain having scattered ponds (the mudstone) and crossed by streams (the sandstone), where there were occasional debris flows, some confined to channels (thick conglomerate lenses) and others spreading out over the plain (thin conglomerate beds). The presence of ponds and apparent debris flow deposits are similar to the situation you may be studying. Edited 1 time(s). Last edit at 05/13/2012 02:23AM by Norman King. This photo shows dropstones. I mentioned those in an earlier post. This is marine mudstone showing episodic deposition (thin bedding). The area was at least occasionally covered by glacial ice advancing from a near-by landmass. The ice contained pebbles and other sizes of lithic debris that fell onto the sea floor, the larger ones making little “craters” like you see here, as the ice melted underneath. The next photo is a larger view of mudstone containing scattered dropstones and an interbedded debris flow (where the hammer is). This is the last photo. It shows gradation from coarse conglomerate deposited by very energetic mass movement (debris flow) at the base, upward to pebbly mudstone. Not shown here is the overlying layer of mudstone with scattered dropstones. That was in the next photo above. This could be very similar to what you are working with in the Pleistocene deposits there. Possibly a glacially-dammed lake broke, with the initial torrent transporting the larger clasts. As the current diminished, there were fewer and smaller clasts, becoming more widely spaced in the mud. Bones might have been deposited then, except these are Precambrian deposits that predate multi-celled life. The overlying layers (see next photo above) show the usual quiet-water lake muds with dropstones–analogous to your overlying reddish clay with pebbles but no bones. I think your photos DV000269-001 and DV000291-001 are most similar to the Gowganda Formation analogs that I sent. Any two groups of photos of different formations in different parts of the world are going to be different. But the basics of these are quite similar, and considering that one set is Pleistocene and the other Precambrian, that's impressive! Classic outcrops and good discussion thanks Norman. We have very similar geology outside my door here: hornfelsed late Carboniferous to Permian mudstones with lots of drop stones and some pebbly horizons that probably form as described, grading up into Limey fossiliferous sediments too. It indicates how pervasive that ice age was, but life bounced back rapidly! > the ice melted underneath. > Norman thanks for that ive got my head round most of it and its fascinating me, as i can see simmalaritys with my softer stuff, and it makes sence yet if ime to believe the explanations ive had from the people over here who have kindly tried to help me over here the deposits they say can not be pliectocene! becouse they say them deposits would have been bulldozed by the last devension ice flows? But with all that said they can not yet give me an explanation of the laters ime excavating and what it contains, the area has been studied in the past but as far as i can see it was limited to sparadic bore holes and surface views in the deep beck valleys, ive tried to explain in my blog that the bore holes would have quite easily not picked up on the 3 to 400mm gravel bed and the thin bright coloured clay layers, and that a surface view of the beck valleys would indeed look like boulder clay as each individual layer would as i still observe it doing, fold into each other as each one gradually collapses. These pics are of an outcrop i uncovered just to the south of my main excavation, we have aurgered this deposit it sits directly below the dry red brown loamy clay that covers this area, it apears to be alluvial in origin with occasional minor angular and sub angular and rounded pebbles along with intermittent specks of mica, jurassic fossils are also present in very good condition, i was informed by the geologists present that after a test with dilute HCL it indicated a high calcium carbonate content. this stuff is real tuff i was informed by the geologists this blue red clay along with the upper red brown clay this was the hardest clay deposits they had encountered. Three more images in next post. > debris flow (where the hammer is). > was in the next photo above. > clasts, becoming more widely spaced in the mud. > clay with pebbles but no bones. > I hope this makes sense. Edited 1 time(s). Last edit at 05/13/2012 03:44PM by Heath Barnes. Remember, Heath, that the deposits left by the most recent glacier, as it retreated, would not have been bulldozed. Each glacier does, indeed, destroy most of the deposits left by the previous one, but here hasn't been a new glacier yet to destroy what you are digging up. Norman the last retreat of ice has now been re dated here it was thought to be around 12.000 ya but now is believed to be more like 21.000ya, my own ides on what i might have found are that the gravel bed and related clay deposit above it could belong to an interglacial period, were plant and animal life returned only to be devestated by some sharp climate change? But i have only been teaching myself in this subject for about a year and a half, so please forgive any obviose mistakes i may be making, and please all feel free to correct me. PS these images are a follow on from my qoute to your earlier post Norman. Well, I don't see any obvious mistakes. A more subtle thing is to just consider what you have evidence for. And that is a critical part of the discipline that makes someone a scientist. As I suggested, there have been no more recent glaciations to remove the deposits you are digging. So don't try to make them part of an older interglacial. As we discussed, if so, those deposits would problably have been removed. The first thing somene will ask (and rightly so) is, "What evidence do you have for such a more recent glaciation?" Then, you have only a few groups of bones, so talking about devastating the fauna and flora by climate change is going too far at this time. There is evidence for debris flows, some possibly catastrophic, adequate to explain the death of those animals and their transportation and burial at this site. I would stop there. Only after you have information from all over, concerning the whole fauna, and its characteristics over time, can you start talking about climate changes wiping out the fauna. And you would need to know from independent evidence that there were indeed climate changes, and what those were (e.g., colder, dryer, how quick, etc.). You don't become a scientist by how much you know. You become a scientist by how you approach problems. Norman your help i hope will keep coming i am very greatfull for it, the sticking point for me at the moment and proberbly my comunication thats caused it is that ime to believe all pleictocene fauna was abliterated by the devension ice advance only the south of England was left untoutched, so after the ice last retreated there is not meant to be any traces of pliectocene fauna north of Londons location now? Sorry apart from bedrock ie cave locations? If the ice retreated, the surviving life from south of the ice sheet would be very quick to recolonize the newly-exposed land as the ice rolled back. > in verified ("peer reviewed") reports. But just as Norman is saying Heath, don't make things harder on yourself by coming up with wild hypothesis' or speculations on what you are seeing in the field. Go with what your instinct is telling you and follow it until it can be proven incorrect otherwise. It will make understanding geologic principles so much easier to comprehend. Jolyon is right. As the glacial ice withdraws, it deposits end moraines and ground moraines, and the stream run-off deposits the outwash plain with its ponds and lakes, and the deposits formed in such places may contain Pleistocene fauna. If the ice really did withdraw from your area at about 12,000 or even 21,000 years ago, the fauna would indeed be Pleistocene. It is also true that some "pockets" of sediment from earlier glaciations may have survived here and there in sinkholes and other odd places, as you suggested, but that is probably not what you are dealing with. Also, not all glaciers cover the same areas, and somewhere there is left-over morainal or other sediment from a previous ice advance that escaped removal, so some Pleistocene faunas date from glaciations that are several hundred thousand years old (or older, but that does not seem to be your situation, either). Thanks everyone and keep it coming as ive said the more ideas on this the better! would it be a problem if i posted other related stuff with explanations of what i think i have found in the gravel beds with images i would keep it all on this thread? These pieces where dug from the same packed gravel beds, any ideas ? i have thought that the black piece maybee fossill burnt wood? Edited 1 time(s). Last edit at 05/16/2012 11:11PM by Heath Barnes. Edited 1 time(s). Last edit at 05/20/2012 01:35PM by Heath Barnes. I don’t know the origin of that assemblage of things you show, but you have left some things out–namely the slabs of fossiliferous Paleozoic and Mesozoic rocks. Also, it seems to me that the items you show were selected to display. Any deposit may contain some noteworthy items, but if you have a pile of only the noteworthy items, then I can’t really say what you are dealing with. You need to show the routine items. But, yes, all of that material could have been carried there by ice, streams, and mass movement (such as debris flows). There is nothing in the deposits as a whole that is out of the ordinary. HEATH I am not a paleontologist or fossil expert, but a couple of pointers based on what I see and what little info you give in your last picture. The bone fragments may be bone or fossil, if highly mineralized. If found in a gravel type environment/matrix, they are most probably relatively recent......possibly really, really recent or pleistocene; from the ice ages in glacial till. They certainly do not look like dinosaur stuff from Jurassic or Triassic etc. As I see a jaw bone, vertebra and possibly limb bones, these are most probably a mixture of small mammal, and possibly large bird or reptile bones. The animals may be extinct ice age animals or still have living ancestors. You should take all these to your local university or museum paleontology department as they may be interested and then excavate the whole site in an orderly manner, which you may not be currently doing. Here in Indiana there is an ongoing gravel pit excavation north of Indianapolis which is currently a treasure trove of 30,000 year old bones from several extinct ice age animals. If you are unearthing interesting material, the state may have regulations limiting what you are able to do. In addition, IF ANY OF THESE BONES ARE HUMAN, AND FROM NATIVE AMERICANS (doesn't really look like it from you pix), YOU MAY BE IN BIG TROUBLE AS THERE ARE VERY STRICT REGULATIONS AS TO WHAT YOU CAN AND CAN'T DO, EVEN ON PRIVATE PROPERTY. A WORD TO THE WISE HEATH !!!!!!!! The bones all have the characteristic patina of bones that aren’t very old. I can't see in the photo, but I'd bet they are quite porous. Dinosaur bones and other ancient reptiles, as well as very old mammalian bones, are usually more heavily mineralized, and white or cream colored. Sixty-five plus million years will do that (or even 20 or so million years). I am not an expert in paleontology either...but you are right, these are mineralized bones (sub-fossils) from the pleistocene. During the last glacial period, a huge land bridge connected Britain and Europe (perhaps as recently as 8000 years ago) - it was savanna-like, and the species that Heath has found were common there. Identical sub-fossils are being dredged from the North Sea ("Doggerland" area) in large numbers by fishing trawlers,and they are commonly seen for sale (cheaply) at mineral/fossil shows. Earlier fossils are almost certainly those scraped away by the glaciers, and I don't see anything unusual in the pebbles. Like Bob, I feel that Heath should be seeking the help and advice of local paleontologists, because his site is obviously one of scientific value and should be excavated properly. There are people in Newcastle (the Hancock Museum) or Durham University who would be interested. Heath, the fossils from the North Sea are not stable, and need preservation - apparently, they begin to crumble over time. You have made a most excellent find, and should get full credit for your curiosity and work, but your site really should be reported to professionals. Bob, I suspect that Heath's deposit, on the eastern coast of England, is unlikely to contain Native American bones. Bob ime in North east England and do indeed have permision from the land owners infact they are very keen to find out about the gravel beds ive descovered, i am in contact with Archaeologists and geologists both local and further afield, also if you view my blog at historyofabeck.blogspot.com you i hope will see i am conducting my excavations in as correct a manor as possible considering my limited resources ie i was unemployed for the first year of my work sometimes having to use half a spade and a screw driver to excavate, and a kids camera. Norman sorry your right not enough info with the images! the mineralized bone ive managed to educate myself to what ide call a more than decent level ie they when dug directly from the gravel bed mostly caremel in colour and all heavy with the same greasy shine as the minerals rocks and fossils found, not one bone dug from the gravel beds shows signes of attention from human nore scavengers. the bones look to date late devensian - early holocene. Becky ive been there and had the t shirt as far as Durham university and local museums are concerned they are and i quote monertering the excavations via my blog, the county geology group are involved and we have augered parts of the area surrounding the excavations, so far finding that the layers that cover the gravel beds and there are at least 3 seperate levels are aluvial in nature. Jolyon yes i think ime unlikly to find any Elephants ! ;-)Again thanks to all for there interest and input sorry for the lack of info sometimes but theres a lot of it and only so much space. Edited 3 time(s). Last edit at 05/20/2012 01:41PM by Heath Barnes. The first image in the previouse post shows variouse slabs containing fosssils ( all well preserved) the second what ime quite sure is Carboniferouse limestone, the next shows my daughter pointing out a mandible piece excavated from the gravel bed, and the image on this post shows the same piece after a wash and it had dried so far all we know is it looks to have belonged to some kind of bovidae. > his find to the attention of local "official"
Bob thanks for your input all is most welcome but if you viewed the begining of my blog it clearly states that i am studying the geology and fossils and mineralised bone found in it in the south west area of cleveland north east england ime sorry if you missed it. Edited 1 time(s). Last edit at 05/20/2012 01:45PM by Heath Barnes. Do I understand correctly that you collected those slabs as loose clasts in the gavelly layer such as your daughter was digging, and in which the bones are? Bob i hope you change your mind as all input is as ive said greatly needed and welcome, as for my blog there is also two seperate statements one basicaly saying ime not very good at this blog thing but please bare with me, the other that i use the blog as a record for myself, and sometimes just need to get something on there to record it, so your right its not the best but hopefully one day when i get to the bottom of what ive stumbled across ile sort it out. Edited 1 time(s). Last edit at 05/20/2012 07:15PM by Heath Barnes. Norman yes all the material ie mineralised bone, fossils,Carboniferous limestone and Jurassic mudstone slabs, minerals, mercia mudstone, magnetic basaltic andesite, graphite, septerian nodule, flint burrow nodule, and unknown rocks in these images were all excavated from a 3metre square x 300mm deep section of the packed gravel bed. Edited 2 time(s). Last edit at 05/20/2012 07:34PM by Heath Barnes. The image above is ok but the zoom quallity is poor on this site why i don't know, but its fine on picas sorry. Wow! I’ve never seen a debris flow deposit like that! But don’t conclude anything rash from that statement. The material you are working was unquestionably deposited by a debris flow. Nothing else can deposit a sediment like that, and, at the same time, debris flows are quite up to the task. I googled “glacial debris flow” and clicked on “images” for results. Lots of great photos of debris flow deposits, and they are usually associated with a story of some sort if you click on them. On the 3rd page of results I was surprised to find a photo that I uploaded to Mindat, photo no. 401791 (“Megaconglomerate in Gowganda Formation”). Also on page 3 of results is another photo (at http://clasticdetritus.com/2009/09/18/friday-field-foto-93-permian-debris-flow-deposit-in-death-valley/) showing a “Permian debris flow deposit in Death Valley” and listing characteristics of such deposits. Then I found this video of a debris flow in progress, accessed at http://www.encyclopedia.com/video/k3W-wDIR-Os-debris-flow-event-25-december.aspx. You gotta see that video. In so doing, you will see how a deposit such as yours forms, and why the bones you collected are so fragmental. The violence of the flow will be self-explanatory. If you were caught in such a flow, your remains would be in just as bad shape! And you will see why it is unlikely you can find bones in any better condition, or that what you find will be indicative of any particular setting. One of the reasons we like to see professional work in excavating such deposits is that the matrix material will be carefully and systematically collected and examined, including sieving it back at the lab and examining the residue in each size grade under a binocular microscope to find other indications of what the ecosystem was like–looking for pieces of insects, worms, seeds, pollen, leaf fragments, rodent teeth and bones, lizard remains, fish scales–anything! Your deposit is not suited for that, however, because of its origin–it’s probably a mixture of a lot of things from several micro-environments, all jumbled together. I think people would look, however, but only to confirm that. Quite a study you have, though. With the advice of experts, you should find out exactly what to do with it. I have worked with amateurs myself, and my experience has been generally favorable. With your interest level, you may find things that no professional would find, simply because they usually have other projects to take their time. I think you are doing well, and I congratulate you on your approach. I would be glad to look at anything else you wish to show. Thanks for that Norman and your explanation makes sence to me but i would like to ask your opinion on something that puzzles me, from what i have studied and already new about this part of north east England, i believe there are two prime candidates for a flow like this one was about 3 miles to the north an ice damed lake, and a valley area to the south east ( the esk valley) but as ive mentioned before these deposits both the gravel bed and almost stoneless seperate aluvial layers that cover it, ive found to be the same in thickness and make up both north and south of the natural barrier that is the Cleveland dyke, i would have thought the dyke would have had an influance on the nature of the layers either side of it? i hope you get what ime trying to say. Again thanks for the help and i welcome any help or ideas any othe forum members have. > or ideas any othe forum members have. This is a great discussion! Just wanted to show you some of the Breccia we have in Northern Vermont. (New England, USA) I learned this from the brilliant minds here at mindat. The schist is mica, the cobbles are quartz. This piece i picked from the beck floor, i am sure that the beck gravels and rocks mineralised bones and minerals for the most part origionate from the gravel bed and were washed through at some time in the past. I have hundreds of very well preserved mineralised bones that i believe came from the gravel beds, thing is life was not supposed to have survived the enitial glaciation, if so where are my bones from? Any way heres the peice i found today i believe it may be a coral or sponge ive not seen before? the material its made of seems dark where it can be seen and maybee crystals are to be seen? it does bubble a bit with viniger? and its heavy. We (Jolyon and I) have already answered the question of where the bones came from. They were washed out from a deposit left by the last melting glacier. Maybe you can ask the question in a different way for me to see why you are puzzled by this. The debris flow occurred after the last glacier retreated, and it eroded deposits left by the glacier or its meltwater streams, in which the bones were left–possibly by flooding from a glacial lake, but that isn’t necessarily the case. Your question about kimberlite was excellent! 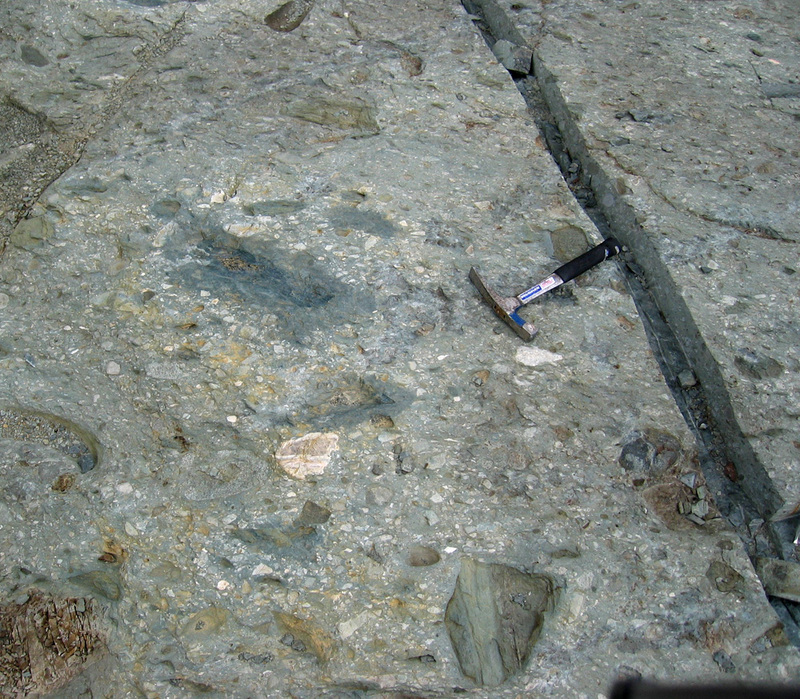 In looking at your photo, I see that the deposit appears to include ultrabasic rock fragments. They’re grayish green. Compare them with this photo of kimberlite that I posted on Mindat. In your photo, if the over-all rock is schist (I can’t quite tell from the photo), then it looks like a metamorphosed kimberlite. However, I would not expect to find a kimberlite in Vermont. Now, this is really advanced geology, but it turns out that kimberlites “erupt” in cratonic regions such as the Canadian Shield (my photos), not in orogenic belts such as the Appalachians. I am impressed that you saw the textural and apparent compostional similarities, nevertheless. You’re good. You could be a geologist! Edited 1 time(s). Last edit at 05/22/2012 04:45AM by Norman King. Norman the simplest way i can put it is that before the last ice melted here ie the end of the devension period, the area is said to have been devoid of any mammal life forms, therefore the only way i can see an explanation as to where the animals they came from is a period of warming that allowed animals to return from the south, there are is as far as i know no evidence for this in this area other than what ive descovered here. Sorry if ime missing something. As for the debrie flow what i was trying to say is if a flow hits an obstical as it would have ( the cleveland dyke) there would be a difference in the bed left behind on either side of the obstical yet ive found the gravel bed to be almost identical in depth and formation either side of the dyke.? Becky ive never came across a referance for ice age mammals living in this area during the ice age? and yes the powers that be are quite happy to let me dig alone ! it is more complicated than that if ime honest, but the geologists ive mentioned that are kindly helping me are indeed from the rigs group, also ime sorry ive not mastered ploting on maps on a pc yet but these finds cover an area from the leven in the west to ormesby beck in the east aprox 5 miles x 2 that i can ime sure prove are the same deposits in at least 4 layers. Becky along with the help of others its great to have someone on board with a first hand knowlage of the area, ive not looked at your profile yet nore anyone else, but if your not far away i would be very happy to show you or any other interested members these deposits, believe me ime not looking for plaudits just answers . Becky/ Norman i would also for the record like to say i have stored samples of seeds, wood , bark, and clay deposits from variouse digs in the area ime studying, i do not just pick the shiny things! I have donated a large selection of mineralised bone and fossils to the local infants school, and have explained that this material is from beneath there own feet not from some exotic location , but would greatly love to give them more solid information, as i eventually plan to leave all ive found to the school and give the kids something to shout about! Hi Heath, Mammals lived in northern England during inter-glacial periods. As you know, there have been multiple periods of glaciation in Britain, which have varied (even locally) in the extent of cover. Between periods of ice cover (including BEFORE the Devensian), mammals were found in the north. Also, remember that rock layers here are tipped downward, exposing at or near the surface rocks of many ages in the northeast. I haven't seen any rocks in your photos that could not be explained by glaciers scouring these layers, along with debris carried from beyond. As for the Cleveland dyke acting as a barrier...I know its age, but do not know at what point it was partially exposed at the surface, so I don't know if it acted as a barrier during the Devensian or whether it was subsequently exposed by meltwaters (which were enormous), erosion, etc. Thank you for the invitation - I would very much like to visit, perhaps later in the summer when our own work is winding down. (I'll contact you by PM sometime before.) I am most certainly NOT an expert in this field, but very much interested. In the meantime, I'll try to speak to a few people who are more competent (than me) in this area. The RIGS group should be able to access journal papers for you. I agree with the comments Becky made. I know nothing about the dyke, such as its lithologic composition, orientation with respect to current and ancient (pre-glacial) terrain plus strike and dip, directions of ice movement, runoff, and debris flows, or anything else, so I cannot comment on it. There would be nothing wrong with your simply describing its relationships to other deposits in the area, discussing this with your contacts, and moving on. After all, you can’t do everything, especially all at once. I suggest you write out what your objective(s) is/are, and then limit what you expend your energy on. In the mean time, if you record your findings somewhere, people will have that information, and maybe those who have the knowledge and expertise can use it in their studies some day. Right now you need to decide if you are doing paleontology or any of its subdisciplines such as paleoecology or taphonomy, or if you are doing geomorphology or any of its subdiscilines such as glaciology. Becky - Norman sorry i confuse myself sometimes with the amount of new material i try to get explanations for as Norman say in to much of a hurry, thing is i started reporting these finds nearly five years ago to the proffesionals. my first reported find although not excavated, a carved bone was viewed in several universitys but could not be explained, i then started finding more mineralized bone and stone tools, so i decided to get permition to start excavating and descovered the sequence of aluvial clay deposits above the gravel beds. Then i started finding the fossils and bones to me it was obviouse that the loose material in the becks must have origionated from the gravel bed, i tried to explain this to people but was basically patronised and even ridiculed to a certain extent, ime not the type of person to take this lying down so just worked harder on my excavations as i still am so please don't mistake my will to get to the bottom of these finds as some kind of arrogance or ignorance! i need all the advice i can get. Heres some of images of a stone tool i have that ime certain origionated from the gravel beds. ps why don't the vry smooth shiny bones ime finding not have scratch marks from being tossed between the rocks? I understand all the things you mentioned about trying to get someone’s attention. But I guess you do have a few people there who will help you out. Keep in touch with them. Learn all you can so you sound like you know what you’re talking about. I can say that some of your questions interest me. I taught paleontology for 20 years, and have never heard them. To wit, your new question was about how the bones could have been tumbled about with boulders and not been scratched. Well, I can’t answer that, because I don’t know what happens to bones that are tumbled about with boulders. Maybe they don’t get scratched much. I’m sure someone has done experiments to determine that, but that’s not my specialty so I am not familiar with the literature. The video, in the URL I sent recently, showed very large, angular boulders–some must have weighed a ton–rolling along in the debris flow. But your photos show rounded boulders. They may have been in a stream and were rounded before being picked up in the debris flow. Maybe rounded boulders of relatively soft carbonate would not scratch bone. I looked again at your photo DSCF1233-001, and made copies of two of the bones which I insert below. I can tell you for sure that these bones were fractured by intense force. They are broken near the strongest part of the bone–near the condyles. And only even greater forces could have broken them closer yet to the condyles. And they are not broken at the epiphyseal plate (that’s technical--for those of you who know bones!). These are unusual. Long bones tend to break near the middle, not near the condyles. Thus, I conclude that the forces in a debris flow involving boulders weighing many kg could have done this damage. That’s not very scientific, but it’s as good as I can do. I don’t know about stone tools. I suggest you look through publications showing stone tools, and see what you have. If nothing like this is shown, I would guess it is not a stone tool. You need to show these to an archaeologist. Now, don't ask me how I woud explain this if it is not a tool. That's not my responsibility. It is your responsibility to demonstrate that it is a stone tool. I mention this and put it in these terms because it is important, and will help you gain credibility when talking to professionals. In other words, don't challenge them. The challenge is yours! Edited 1 time(s). Last edit at 05/24/2012 02:39AM by Norman King. Thanks again Norman for the advice and interest, firstly ive shown all of everything ive found to the apropriate proffesionals in the area, i photograph everything i find from first descovering it to the end product after cleaning, i do have one bone to pick ( excuse the pun) with your advice that is i respect anyone who shows respect for me but if i inform a proffesional? who gets payed via my tax about something ive descovered after moving tons of material to get at, remember for every 1 metre sq x 300mm section of gravel bed i get to break up and look at, i have to move up to 8ft of packed clay deposits from above it! And they tell me great we will keep an eye on your blog i don't think ime in the wrong to challange a system that believes this is correct way to act, 4 years ago i was acompanied by an archeologist to the area, i remember he said if only we new where to dig! ive now shown him and his entire department exactly where to dig in several different locations, ime still waiting! As for the tool like ive said above ive shown all my finds to local proffesionals this piece i showed to 2 geologists they did not bat an eylid before saying it was used and shaped by man, i would not state it as a tool if i had not been convinced myself and been advised that it was. again thanks for the advice and interest. Heath, as a retired academic archaeologist, albeit from a different part of the planet, I would like to respond to two aspects of your latest post. First, state-funded archaeologists are not obliged to share your enthusiasm, no matter how energetically you pursue your research. They probably have structured research programmes of their own, and can't easily be diverted without losing their financial support. If you had funding to offer to contract archaeologists, which I quite understand you don't, it would be a different story. Academically employed archaeologists frequently are approached by enthusiastic amateurs and respond by being politely off-hand so that they can get on with fulfilling their personal teaching and research commitments. Understanding this reality may help you avoid feeling offended. Second, geologists are not the best qualified people to know if a stone was naturally or artificially shaped. The appropriate people are archaeologists with experience in Stone Age artefacts. Many naturally broken stones may resemble artefacts, and sometimes it is only the context and the associated material that allows one to make a diagnosis. My advice to you is to keep in regular contact with the professionals in your immediate vicinity; and watch out that you don't get shunted aside when/if you do find something that ignites their professional interest. Thanks for the advice Duncan and yes i do understand the limitations on local council funded archaeologists and geologists, my gripe is this, ive more than proved that what is under our feet here in the south west area of Cleveland is not what it is recorded as being by past proffesionals, the very proffesionals papers that were first used to patronise and ridicule my ideas, now i have what i believe is clear evidence that these very papers were written withought the authour carrying out the work to be even be close to being sure about what they stated in these papers! I even believe i know why they came to there conclusions and how easily they would have missed these deposits studying bore hole material. Duncan as for the being pushed to one side once the powers that be may finally take seriouse interest, ive allready been warned on a few ocasions, but thanks for adding to the advice. I would like to say this i have honestly asked myself a lot more questions on my ideas since starting this thread becouse of getting the most welcome input from all, thanks to all, and please keep it coming. The 3 images show an excavation i did this evening about 3 miles east in another deep beck valley, the pics arn't great but hopefully show how the deposits mach the deposits found in all other excavations, i did not find a single stone in the deposits above the gravel bed shown close up in pic 3, and as is the case in all excavations the organic blue gray layer sit just above the gravel bed, then the red - brown and as always the gravel bed sits on top of the tight plastic maroon looking clay. Ps our bed rock here is mercia mudstone ive only found it a few times and only once in an excavation. Edited 1 time(s). Last edit at 05/25/2012 11:38PM by Heath Barnes. These 3 images show a large basaltic andesite boulder that easily attracts a small weak magnet, like most of the basaltic andesite both washed from the stainton gravel beds and still in place in the remains of the Cleveland dyke. The last image shows a close up of the maroon- red plastic clay that sits beneath the gravel bed at all locations. Edited 1 time(s). Last edit at 05/25/2012 11:57PM by Heath Barnes. These images show different excavations in seperate beck valleys but show the same sequence of layers. Edited 3 time(s). Last edit at 05/27/2012 08:50PM by Heath Barnes. You have stated that you believe your excavations have disproven the findings of previously published research. Could you please provide citations of the research to which you are referring? I have no idea in what manner you believe you have disproven them. To me, it appears you have found Pleistocene deposits, which are not unusual in Britain. They are here Nathalie ! As ive stated time and time again the area was last proffesionaly? mapped by Agar ( 1954) as being covered by boulder clay, this is not the case and yes i am saying ive done the hard work ie moved tons of rocks and earth and augered parts of the same area, to prove this man did not work as hard as me trying to find the true nature of the deposits in this area, and i will happily state now that no man or women no matter how many letters they may have after there names know the geology of this area better than me, if there was i would have met them! PS Nathalie ive never once stated ive found pliestocene deposits, this would indeed be something as this area was the point at least three seperate glaciers converged on and churned it up down to the Triassic bedrock, or at least this is what Agar believed. Nathaie please don't take this little rant personnal but you hit a few old raw nerves there, mainly that i had found pliestocene deposits you see thats what i first believed only to be told catagorically that this could not be the case by geologists becouse all soft deposits would have been destroyed by the advancing ice from at least three directions. who in his spare time tries to dig for the truth rarther than hide behind old papers scared of upsetting someone. Edited 2 time(s). Last edit at 05/28/2012 09:51PM by Heath Barnes. The deposits you show photographically could well be called boulder clay. Moreover, they are Pleistocene in age. I don’t get it. 1. An unstratified glacial deposit which consists of pockets of clay, gravel, sand, silt, and boulders; has not been subject to the sorting action of water; usually has good load-sustaining properties. Thus, boulder clay can be a synonym of glacial drift (as the above source also says). I believe the term boulder clay is a somewhat loose term. No competent geologist told you there could not be drift (glacial deposits) in this area. I’m afraid you have misinterpreted a lot of what you have been told. I think Heath is referring to this 1954 paper from the Proceedings of the Yorkshire Geological Society. (Below is a copy of part of the abstract; the remaining part mentioned post-glacial peat, etc.) Heath, various authors use different terms - glacial deposits, glacial till, tillite, boulder clay, etc. (and remember that this paper was written almost 60 years ago by an engineer). I just do not understand what it is that you are trying to prove or disprove, and your answers to queries have been vague! There are many, many papers available on this topic, and the Cleveland RIGS people should be able to help you get them. The area described has few surface features, but as a result of collection of borehole data, and observation of excavations, a plan and series of sections have been drawn showing the extent and character of the glacial and post-glacial deposits in the Tees estuary and surrounding area. © Yorkshire Geological Society, 1954"
I think it is time to adjust your course a bit, or you are going to crash. A lot of people here are trying to help you. You have visited with local people who have tried to help. But it seems that you are not learning from what we have said. Among other things, we have told you that there is nothing at all unusual about what you have found. As far as I can conclude, the geology you are encountering is what has been described for the area by previous workers. You need to accept that, learn what the geological history really is, and move in a more productive direction from there. You should begin reading all the recent literature on the surficial geology, geomorphology, and glaciology of this area (Pleistocene is another buzz word), and get some modern geological maps, which usually include detailed descriptions of the deposits. You can’t do field geology without having and understanding the maps. Go to a university library. Tell the librarians what information you are looking for. They can help you. There may be pamphlets available at tourist places and government offices that discuss all the basics to help you get started. And, for sure, you can’t keep depending on others to tell you everything you have found and otherwise need to know. These people who have been so generous with their time have their own projects to work on. 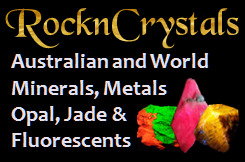 Norman ive only ever asked for info on the unknown minerals ive found, i have never asked what the geological deposits are only why they are! as ive said i allready know what they are along with the geologists and archeologists who have visited the excavations with me, but unlike you and becky we can't explain why there here, maybee i should ring them and tell them the mystery is solved now ? Edited 1 time(s). Last edit at 05/29/2012 11:27PM by Heath Barnes. Norman the deposits have been viewed on site by three geologists three archaologists and have been said by all to be late devensian to early hollocene. Boulder clay and till are NOT terms used by professionals to explain things we don’t understand. We know how and why these form. In fact, in currently glaciated areas we can watch these things form. (See any physical geology text for a basic explanation. If you want a more technical discussion of the process see Evans et al., 2006, Subglacial till: Formation, sedimentary characteristics and classification). From all that you have shown, it would appear that you have some glacial deposits in that area. The geologists and archaeologists tell you they are Devensian, which is the late part of the Pleistocene. Having glacial deposits from that time period is not surprising. If you do not agree with this analysis, please present data as to why you believe you have something else. If you have a specific question, please ask it. I and many others here would genuinely like to help you. We cannot, however, help you if all you provide are rather vague rants. By the way, I worked very hard to get all those letters behind my name. Please don’t disrespect that. Nathalie i never set out to disrespect anyone! but tend to find it the best form of defence when being disrespected, i explained and offered the record that is my blog to show the work ive undertaken over the past 5 years. Yet ime still being disrespected by people like yourself, i repeat me my spade and intelligence have allready found the recorded deposits to be wrong! And am backed by both Archaeologists and Geologists who have visited the sites, in that they openly admit they do not understand the deposits! These people know more than most about what should be found under foot in this area, but only i know exactly what is to be found under foot as ime the only person ever to take the effort to dig and view it! in many locations and record it as never before. Ps funny enough ive only tonight been informed by one of the first geologists who visited the sites with me, that he believes he can help me secure funding for my work, and as for your pressing profesional schedual i work a 9 hour day yet don't winge at having to move tons of material to further my understanding of the deposits ime excavating. Please like a lot of other proffesionals ive had dealings with get of that high horse and listen to people instead of preaching old papers, there was once a set of proffesionals who believed the world was flat! Then there were the anti Wegener brigade where are there papers now? Also Nathelie i see your a proffesor of geocience then i ask this as ime sure you can help me, i have found tons of magnetic basaltic andesite belonging to the cleveland dyke in the gravel bed and have repeatedly asked not only here, for pics of weak magnets stuck to basaltic andesite, and as yet after nearly 2 years of asking have never found another image anywhere ? But ime sure i can rest now as ime sure a proffesional such as yourself will have reference if not images. I'm not sure how a photo of a doleritic dyke with a magnet stuck to it will answer anything; the Cleveland Dyke sounds like a typical diabase dyke of the Mull Intrusive Complex which is not that different than any other diabase/dolerite. Almost all basic dykes are magnetic to some degree, no matter where they are found. Also, the figure you provided (alayers pic.png) tells me that the Cleveland Dyke had no significant influence on the deposition of glacially derived material as it is the same on both sides. 1) What do you believe you have found? 2) What evidence do you have that suggests this? 3) In what way does this agree/disagree with previous work? 4) What specifically do you find confusing about what you have found so far? You have a wealth of information and knowledgable people here on Mindat that will help you; however, using statements such as " i will happily state now that no man or women no matter how many letters they may have after there names know the geology of this area better than me" will only serve to alienate the very people that are taking time out of their busy schedules to assist you in this personal research you are conducting, whether it is true or not. At this point, I will say that I am still trying to help you because your motives are good, you are certainly dedicated to this project, and you should be able to make something of it. At present you are depending on people such as our group to help out because you don’t have a strong background in geology yet. I again urge you to begin to rectify that. Also, if you show resentful attitudes to professional people who visit you on site, they won’t be on your side very long, just as people here are beginning to resent you. I can see why some have rolled their eyes when with you (as you said), and scoffed at you behind your back. Even if earlier workers were wrong, there are probably good reasons why that is the case, so your contempt of these educated and accomplished people is likely unwarranted. What did people think in 1954? What terminology did they use in their work? For example, an engineer might very well refer to “boulder clay.” He wasn’t hiding behind a meaningless term–it probably meant something to an engineer. You should try to find out that sort of thing, especially before heaping ridicule on them. As Paul suggested, there is no reason why photos demonstrating the magnetism of basic intrusives should be available, so baiting Nathalie to come up with some is not appropriate. She hasn’t even given you any erroneous information, and yet you already disrespect her. As for your comments to me, I understand that your deposits are late Devensian to early Holocene. That has nothing to do with the fact that you have only confirmed what is already known about the area. It seems that you were surprised by my interpretations. That was the “why” you asked about. I wasn’t there to hear what people have told you, but I can say that the deposits you are working with are not unexpected, and the fossils found in them are not unusual. The cross section of the Cleveland Dyke you included with a recent post is exactly right, and matches what your photos show. But now you have more information (interpretations), and I think you can also provide better descriptions and more detail now, and maybe increase the depth. I detect that this project has become something of yourself–the image you have of who you are and what you are doing, and also that you are going to turn the world of Pleistocene glacial stratigraphy and paleontology upside-down. That means, however, that you are no longer impartial, and you may have lost some of the judgment you originally had to take in and process the teaching we have given you. In response to a somewhat sarcastic comment you made to me, you can indeed ring people and tell them that you have learned about these deposits, and no longer see a mystery. Don’t remind them that they couldn’t help you, and that this group could. In fact, they may have been giving you short attention for a good time, and your attitude could be the reason. It is true that you alone know what you have dug out. You are the only expert on it. That will always be the case, but it is going to be lost if you don’t get it written up. You will need the advice and help of others to do so. We all do. That’s why science, in modern times anyway, is done by groups of people working together. If, someday, no one will agree to work with you, your efforts will likely have been for naught. Paul gave you some suggestions about what to do now. Those are good suggestions, revolving around organization. Organize your data and your ideas. The better organized you are, the more favorably you will impress people. You have to show people that you have something–give them a report in writing that they can review and study. Earlier I commented on something, and you misinterpreted my point. That was that you shouldn’t challenge the people at the museum or geological survey. I meant that you can’t come along and say something like “OK, if this was deposited during the Devensian, why is it still there?” In other words, you try to make them explain something they haven’t studied. Instead, it is YOUR responsibility to tell them what you have found, and what you think it means–your data and your interpretations. This is what Paul was getting at (we all have different ways of saying the same thing). People can then comment on your ideas, and maybe ask some questions that you will have to answer at some time (maybe not on the spot, but you will have to do some more thinking and maybe some more digging). You have to put out, and they SHOULD challenge you. That’s the way science works. But you won’t get very far if THEIR attitude is only, “How can I get rid of this pest?” If you normally interact with people using sarcasm and derision, you won’t ever get anywhere, and trying to excuse that by saying they deserve it will simply solidify that outcome. Curt explanations that “That’s just the way I am” won’t help, either. Their time and energy is limited, and they will easily find others to work with. You need to get people on your side rather than making enemies. Good luck! I read and agree with some of what you say Norman but firstly every proffesional who has actually visited and viewed my work and met me the person, are still very much involved. And most willing to help, as i said to Nathalie i do not set out to upset anyone but will not be patronised, but this at present is begining to be almost a childish disagrement, that i have contributed to, along with others, so ile just keep the thread going as i descover more. > the same on both sides. > 1) What do you believe you have found? > 2) What evidence do you have that suggests this? > what you have found so far? > it is true or not. Paul the Dyke is said to be made up of basaltic andesite and yes dykes in generall are known to deflect compass needles, but i am yet to read a paper old or new refering to samples attracting a magnet of any kind never mind a weak fridge magnet if you know of such a paper i would be most greatfull if you could let me know. Heath. Puffett, W. P., 1974, Geology of the Negaunee Quadrangle, Marquette County, Michigan, U.S.G.S. Professional Paper 788, 51 p.
Bridge, D., Drown, T., and McRoberts, G., 1996, Geological, Geochemical, Geophysical, and Diamond Drilling Report on the Corey Property, British Columbia, Vancouver, Canamera Geological Ltd., 51 p.
Both of these papers reference diabase/dolerite/basaltic andesites that attract a magnet. Now that I have provided you with these supposedly elusive papers, it's your turn; please answer the four questions I posed in my last post.